The Brewers celebrate their sweep of the Rockies in the NLDS. The Milwaukee Brewers ran their win streak to 11 games by knocking off the Colorado Rockies at Coors Field on Sunday, sweeping the best-of-five National League Divisional Series. 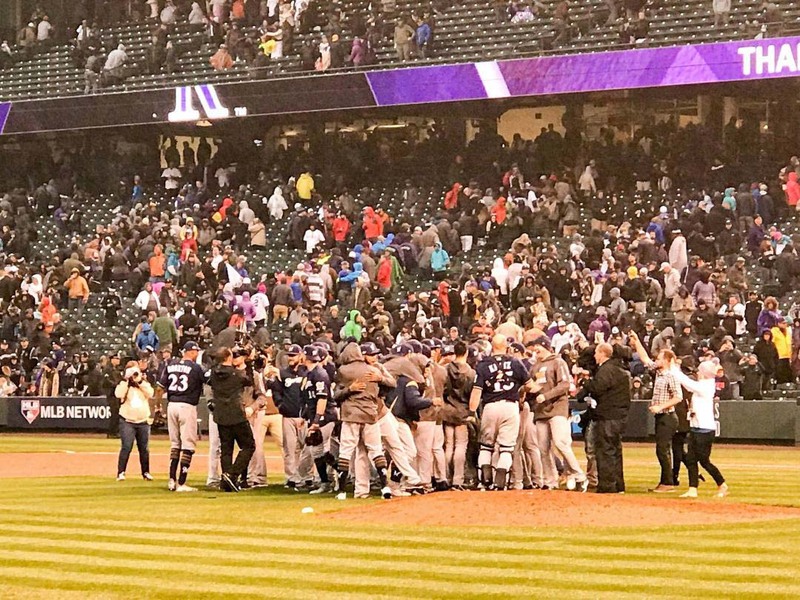 Wade Miley and five relievers blanked the Rockies while Jesus Aguilar, Orlando Arcia and Keon Broxton all homered to power the Brewers 12-hit attack. The Brewers advanced to the NLCS for the first time since 2011. It starts on Friday at Miller Park against the winner of the other NLDS between the Los Angeles Dodgers and Atlanta Braves. Brewer pitchers held the Rockies to just two runs in the three games. After taking a 2-0 lead early, the Brewers scored twice in the sixth on a balk and a wild pitch to jump out in front 4-0. Orlando Arcia started the 9th with a home run to left off of Rockies closer Wade Davis. Keon Broxton followed with a home run to right. Josh Hader got the final two outs to close it out for the Brewers. 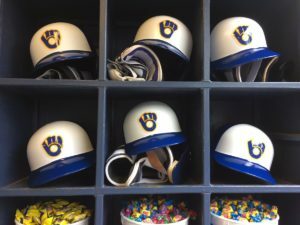 The Milwaukee Brewers will open a two-game series against the Kansas City Royals on Tuesday night. Freddy Peralta (2-0) will make his Miller Park debut for the Brewers. Earlier today, the Brewers announced that center fielder Lorenzo Cain has been placed on the 10-day disabled list (left groin strain). The move is retroactive to June 24th. 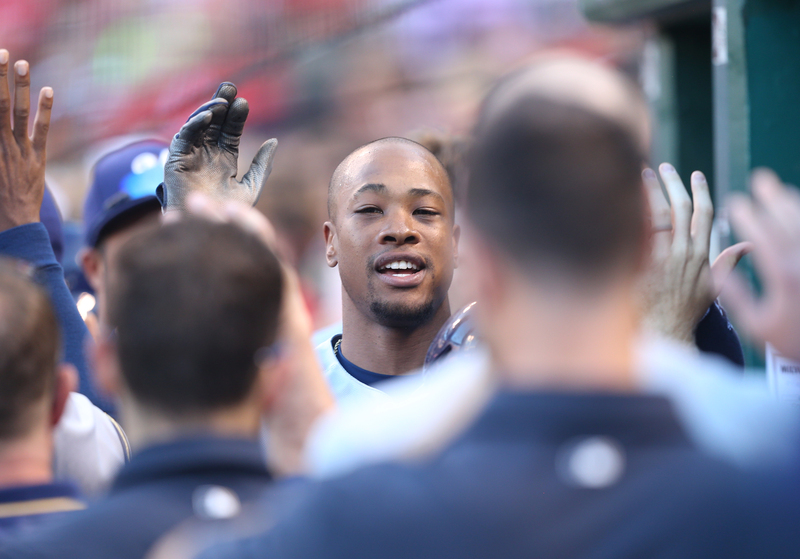 They recalled center fielder Keon Broxton from AAA Colorado Springs to take his place. The Brewers also released left-handed relief pitcher Boone Logan. Left handed starter Zach Davies will also make his next rehab start on Friday night with the Class A Wisconsin Timber Rattlers. The Milwaukee Brewers won 86 games in 2017 and are turning up the heat on the rest of the National League Central. The Brewers traded four players, including top prospect Lewis Brinson to the Miami Marlins for outfielder Christian Yelich. The Brewers also sent outfielder Monte Harrison, infielder Isan Diaz and right-handed pitcher Jordan Yamamoto to the Marlins. The Brewers didn’t stop there. 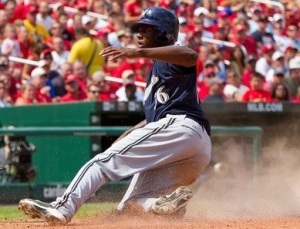 They also agreed to a five-year, $80 million contract with free agent outfielder Lorenzo Cain. Cain began his career with the Brewers before being sent in a package deal to Kansas City in December 2010 for pitcher Zach Greinke. Jesus Aguilar clubbed two home runs and added 3 RBI as the Milwaukee Brewers knocked off the Colorado Rockies 8-4 on Sunday at Coors Field. Keon Broxton went 2-for-4 with a walk, two RBI and two runs scored for the Brewers, who have won six of their last seven and remain 2-games behind the Central Division leading Chicago Cubs. Chase Anderson tossed five innings of one-run ball to improve his record to 7-2. Corey Knebel closed it out for his 26th save. Former Brewer Mark Reynolds homered and drove in three runs for the Rockies, who went 3-4 on their seven-game homestand against Atlanta and Milwaukee. Rockies starter Kyle Freeland allowed three runs in 5 2/3 innings and took the loss. He dropped to 11-8. The Brewers open a three-game series in San Francisco against the Giants tonight. Zach Davies (14-6, 4.26) pitches for the Brewers. Chris Stratton (1-2, 4.91) goes for the Giants. 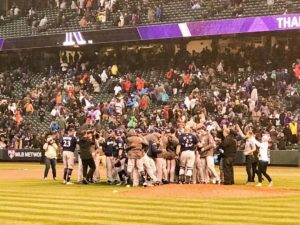 Nolan Arenado put Colorado up for good with a two-run triple in the third inning and the Rockies cruised past the Milwaukee Brewers 8-4 in the series opener in Denver. Charlie Blackmon, Gerardo Parra and Carlos Gonzalez clubbed home runs for the Rockies, who knocked Matt Garza out of the game in the fifth. Garza (6-7) pitched 4 1/3 innings, allowing 8 runs (7 earned) on 9 hits. German Marquez (10-5) tossed 5 2/3 innings of four-run ball to pick up the win. Keon Broxton (20th), Domingo Santana (20th) and Orlando Arcia (12th) went yard for the Brewers, who saw their four-game win streak come to an end. The Cubs and Cardinals both won yesterday, which dropped the Brewers into third place in the NL Central. They trail the Cubs by 2 games. The Cardinals are 1 1/2 games back but a half game in front of the Brewers. 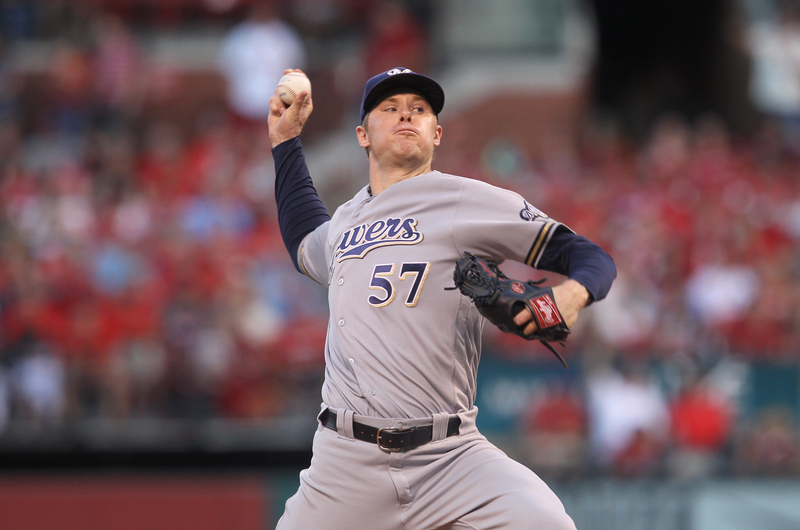 Rookie Brandon Woodruff (1-1, 1.50) gets the start in game two of the series for the Brewers tonight (7:10 p.m.). Chad Bettis (0-0, 0.00) foes for the Rockies. 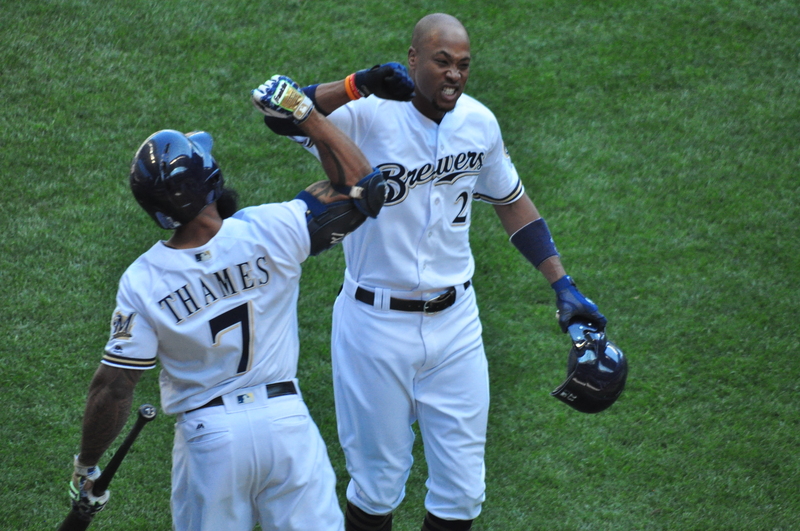 Keon Broxton celebrates one of his two home runs. The Milwaukee Brewers clubbed five home runs to come-from-behind and beat the Pittsburgh Pirates 7-6 at Miller Park on Thursday. All seven runs came via the home run. Centerfielder Keon Broxton clubbed two of the five home runs, giving him 19 for the season. Neil Walker and Travis Shaw also went yard. Manny Pina added the biggest of them all in the eighth. After the Brewers fell behind in the top half of the inning, Pina clubbed a 2-run, opposite field homer to put the Brewers back in front and eventually pull out the win. The Brewers fell behind 4-0 with Jimmy Nelson struggling early. But Broxton and Walker clubbed home runs in the bottom half to make it a 4-3 game and the Brewers were right back in it. Travis Shaw’s 26th home run of the season in the sixth inning pulled the Brewers back to even at 4-4.